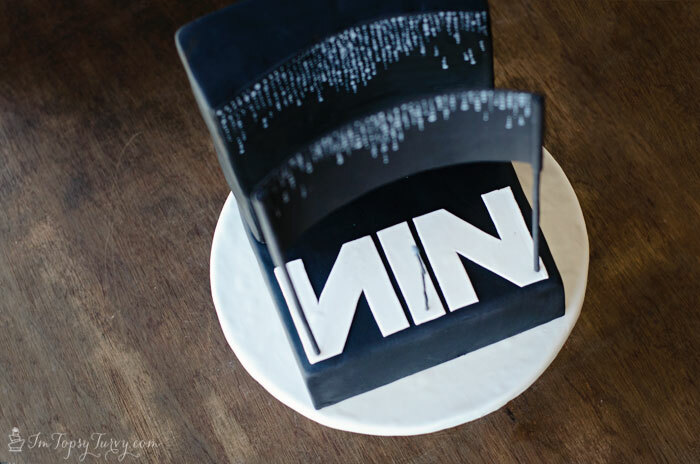 I love getting a challenge, my Cousin called and asked if I could make a Nine Inch Nails cake for her husband’s birthday this year. She said, “do whatever” which is fun, but hard, too much possibilities. so I asked her some questions to get the ideas flowing and she started talking about the “Light Show” concert they attended this year and how great the stage was. So I started looking up images from the concert. Concert pictures are TOUGH because it’s dark, often foggy, or super bright! GAH! BUT it seemed like they had a curved backdrop that’s covered in lights and curved light panel that moves up and down. So I decided to do a stage. I started with a square base. 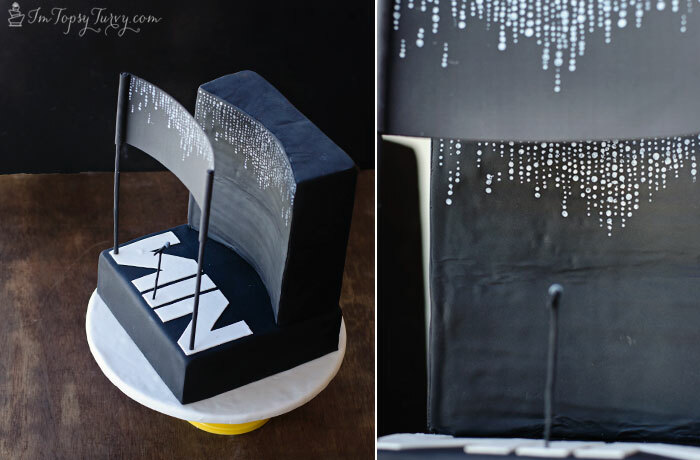 Then stacked and carved more cake to create a backdrop then covered everything with black fondant. 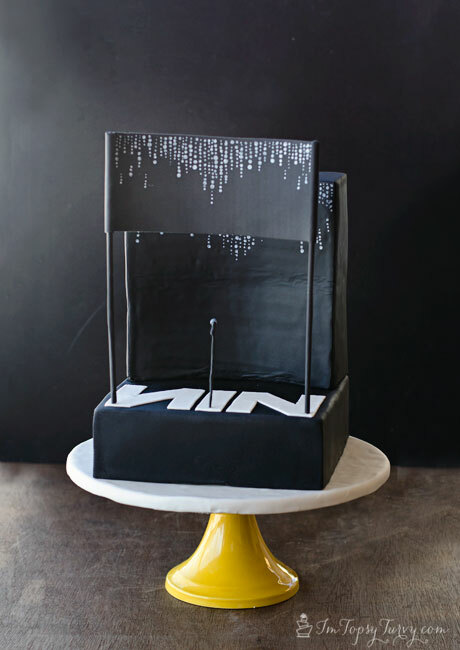 I added the logo on the front of the stage, then curved the some fondant attached to some bamboo skewers and let it dry in a curve to create the light panel. Then to give the illusion of lights I added edible white paint in cascading dots of different size to try to convey the lights in varying degrees of being on/turning on/turning off. Trying to convey movement. awww thanks! It’s harder when you don’t get a lot of direction sometimes because there are SO many directions you can go with it~! awww thank you so much! My focus for 2013 was to learn to take better pictures! So I REALLY appreciate it!!! 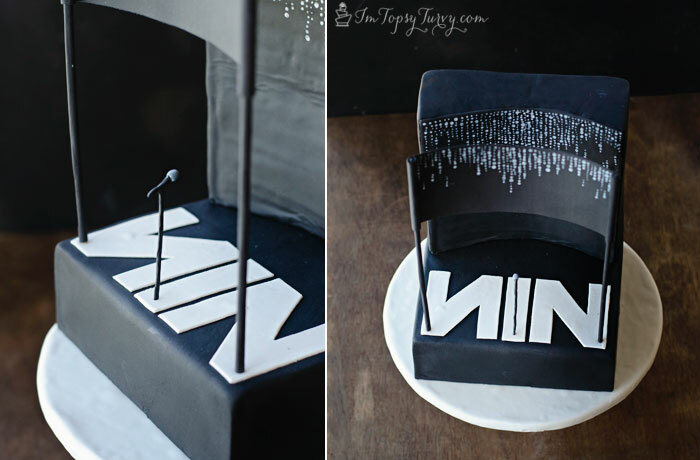 A Nine Inch Nails cake . . . amazing! awww thanks! It’s always fun to get a unique cake order, so much more fun!